One of my continuing goals is to find nonfiction books that excite my students the way that fiction does. There are some topics that fascinate children; books about sharks, Titanic, and Houdini are almost never on the shelf. I really enjoyed Sid Fleischman's Escape! The Story of The Great Houdini, but I don't know if it will be as popular with young readers as the picture book I read about him earlier this year. Fleischman was a magician, which adds to his passion for the subject. He actually met Houdini's beloved widow, Bess, who gave him some of the photos published in the book. That personal touch is evident in the care that Fleischman takes with his subject. Still, the audience was unclear to me. If it is young readers, why use so much convoluted language and such meandering sentence structure? 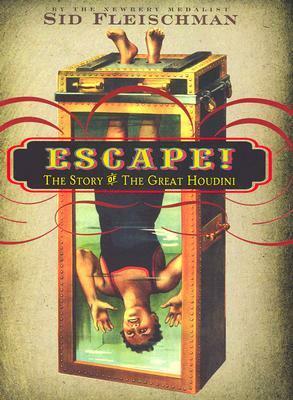 If it is for older readers, why is the font so large and why doesn't it go more into the gritty aspects of Houdini's childhood? This confusion leaves me wondering what to do with this book? My best idea is to use passages from it as practice for standardized tests. The students will be interested in the topic, but will have to work hard to decipher the complex vocabulary and sentences. Definitely not what the author intended, but better than having the book languish unread on a shelf.